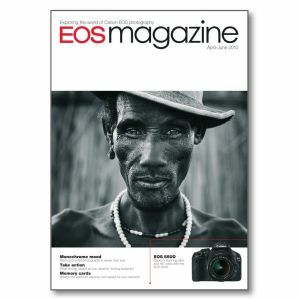 Add this issue to your photographic library for information on the Canon EOS 550D, EF 70-200mm f2.8L IS II USM lens. Plus techniques on sports shooting mode on your EOS camera, digital evolution since 2000, memory cards, black-and-white photography and colour management. New products EOS 550D; EF 70-200mm f2.8L IS II USM. Professional showcase Architectural photographer Anthony Weller relies on tilt-and-shift lenses to photograph everything from palaces to supermarkets. Sports mode Many EOS camera offer a sports shooting mode. What does this do, how useful is it and what are the alternatives? Digital decade Canon announced the birth of its first digital SLR in May 2000. We look at the rapid evolution of digital technology over the last decade. Light play Flash is a great tool for lighting your subject and making it stand out against the background. Did you know that with a few subtle adjustments you can take the technique much further? Black-and-white Playing with monotone. Black-and-white photography is back in fashion. Andrew Gibson takes you through the conversion process. Wish list You buy an EOS camera, and then a new model comes along with an even higher specification. But don’t worry – here’s how you can update your camera to give it some of the latest features. How was it shot? Exploring the technique behind the image. When Vilhjálmur Ingi Vilhjálmsson saw images of flowers perfectly refracted in water droplets he was inspired to take the same photographic technique and adapt it using other subjects. Memory cards Every digital camera needs a memory card, but how do you go about choosing one? Will any card do? We look at the optimum memory capacity and writing speed for your EOS camera. Correct colour To make sure that your photographs are displayed accurately you need to think about colour management. You should start by calibrating your computer monitor – and it’s never too soon.